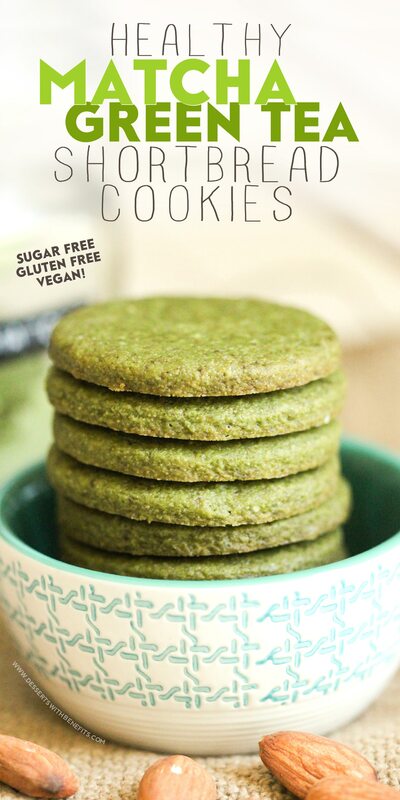 These Healthy Matcha Green Tea Almond Shortbread Cookies are sweet, buttery, sophisticated, and seriously delicious. You’d never know these are sugar free, gluten free, dairy free, and vegan too! 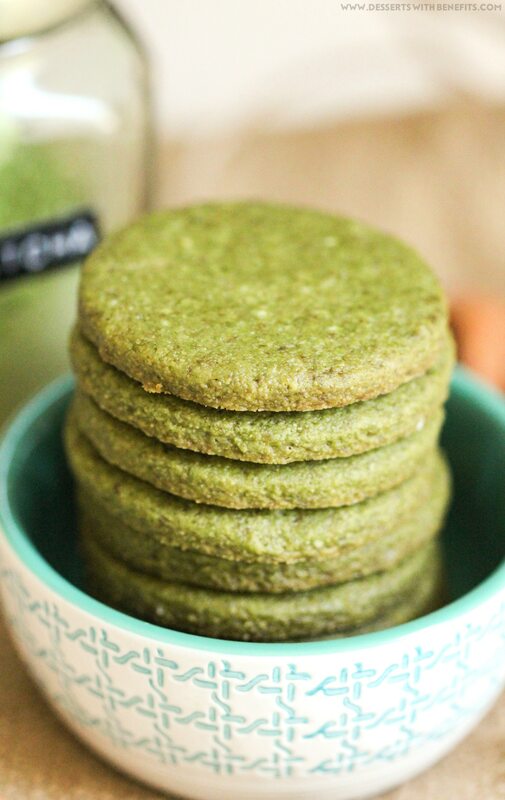 I’ve made two shortbread recipes so far — Classic Shortbread Cookies and these Matcha Green Tea Shortbread Cookies — and I am LOVIN’ ‘EM. They’re just so simple and sweet and rich and addicting, I could eat them forevaaa. I’ve made each batch at least three times and have given so many away to friends and family as gifts or “just because” presents (because unexpected presents are the best presents). And they have been loved by all. Hahaha. I guess they didn’t read the “Matcha Green Tea” part of the label. They just saw strange green cookies and dove in. Even though they probably haven’t the slightest clue was matcha is, at least they enjoyed the cookies. I bet you will too! 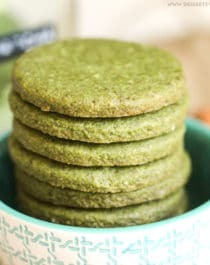 These Healthy Matcha Green Tea Almond Shortbread Cookies are sweet, buttery, sophisticated, and seriously delicious. You'd never know these are sugar free, gluten free, dairy free, and vegan too! In a small bowl, whisk together the oat flour, erythritol, matcha powder, baking powder, and salt. In a stand mixer bowl with beater attachment, add the coconut oil, almond milk, vanilla extract, butter flavor, stevia extract, and almond extract. Mix on low speed until completely mixed. Dump the dry ingredients into the stand mixer and mix until completely mixed. Cover the bowl and refrigerate for 1 hour. Roll ⅓ of the dough in between two silicone baking sheets until ~⅛" thick. Use a 2" circle cookie cutter to punch circles into the dough. Peel away the dough surrounding the circle shapes, putting the dough back into the stand mixer bowl, and transfer the silicone sheet with the circles onto a cookie tray. Bake for 12 minutes. Carefully transfer the silicone sheet onto your counter or a wire cooling rack to cool completely. Keep re-rolling the dough and baking until all the dough is used up. To store, keep cookies in an airtight container at room temperature for up to 3 days. Can the coconut oil be swapped out for apple sauce? I’m sure you can swap a couple tablespoons of the coconut oil with applesauce, but definitely not the full amount. I think too much applesauce will turn these cookies into little muffin tops, and you won’t be able to roll out the dough. hi. could you use almond flour in place of the oat flour? Thank you. I haven’t tried that so I can’t be sure, but from previous experience, almond flour tends to turn things really crumbly. Shortbread cookies are already delicate/crumbly enough, so I would be hesitant to try almond flour here. Thanks for sharing this recipe! I’ve gotta say these cookies were pretty delicious and my family couldn’t get enough of these!! ingredients. Can I use regular butter and granulated sugar? Which ingredients do I substitute? I haven’t tried that but butter and organic cane sugar should work just fine to replace the coconut oil and erythritol. I cannot for the life of me find Natural Butter flavor in my area. What can I substitute in on short notice? Has anyone tried replacing some of the oat flour with whey protein powder? Hi, May I use honey or agave or maple instead of Erythritol? Thks.